As I said in the update on the first page, I think that the wood rot on the roof boards was caused by more than the flashing retaining water. It retained water surprisingly well, but, I think now that the biggest problem was caused by nails. What research I've been able to do points out that tar paper was the way the caboose roofs were covered back when this wooden caboose was used. Maybe a longer nail was employed. I was told by the man in charge of this project that the last time this was covered, a layer of asphalt material was laid out, then tar paper was applied over that. This might be the traditional way to cover one of these caboose roofs; it certainly would work better for a stationary object, like a tool shed. My theory at this point is that as this caboose travels the tracks, there is a certain amount of rocking and twisting motion to the whole car. This causes the tar paper to pull the nails back and forth, which loosens them in the pine boards. See the picture below. This is a corner of the roof on top of the cupola. I've made blue arrows to show where nail holes are. It looks like the nail holes allowed water into two boards, which rotted faster than the other boards. The next picture shows a place on the lower roof where I've removed some rotted boards. This is next to the cupola, near the edge of the caboose. What's interesting, and led to my theory, is that the lower roofs were rotted at these four places; that is, at the corner where the roof meets the cupola, near the edge. I'm thinking that there is more twisting here; or at least, more contrast between the twisting of the roof, and the rigidity of the cupola. The flashing is stiffer that the tar paper, so, between the two of them, there is more sideways pull on the nails, and they loosen faster than other places. Just a theory, and there are other reasons for rot in other places. It hasn't been too many years since this caboose had all this wood work done, Probably less that ten. I can get an exact number by asking around. Anyway, the wood work that was done is admirable in quality of workmanship, the issue is material failure. My guess is that pressure treated tongue and groove 1 X 4's might not have been available, they are a special order item now. I was told by two reputable lumber yards that there was one company making them, but they stopped because wood that thin and that wet warps badly. It could be that the last restorer figured that these were originally made with untreated pine, so that will have to do now. But one has to be careful comparing materials available now with what was available then. They might have used redwood or cedar. Also, it looks like all the rot on the vertical pieces was caused by water seeping into end grain. Seriously, all of it. It's conceivable that since they were surrounded by so much wood back then, that they had practical ways of dealing with it. I know that sign painters have long sealed the edges of plywood, this was likely continued from solid wood signs. 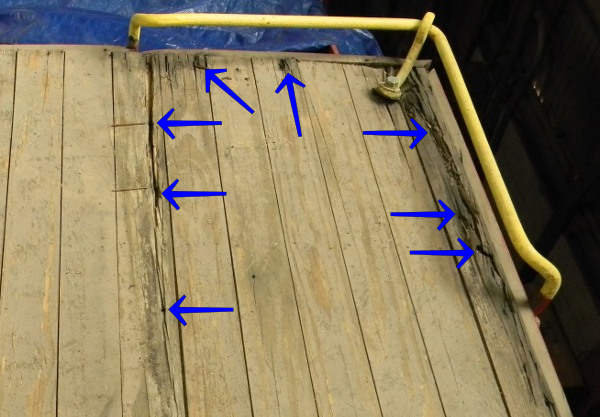 The rot of the wood around the windows appears to be from a lack of caulking, and water seeping in the end grain. One of the window boards still had a sticker on the back of it, saying that it was spruce. At this point, I am only being hired to repair the roof and cupola. The sides will be done later. I'm planning to use pressure treated 1 X 4 tongue and groove material, which I have already made. It is currently being air dried to reduce shrinkage after it's installed.